We’ve previously written about how to approach networking to get the most out of it. And it’s worth getting it right as it can help you grow your business. But what exactly is there to be gained, and what are the top benefits? With the right mindset and the right tools, you become open to a wealth of new contacts, advice, knowledge and opportunities that serve the platform for moving your business to the next level. Networking has been around for centuries, and there’s really nothing to be afraid of. So once you overcome any initial fear and scepticism, there are actually many benefits still to be had from this seemingly old-fashioned approach to business growth. So take a break from Linkedin, newsletters, and cold calls, and get yourself out there. As a business person, you probably know that pushing yourself outside of your comfort zone and taking risks can help you to grow. And the more you do something, the better you become. So, the more you network, the better you will become at networking. And as a result, self-esteem and confidence gets a nice boost. This shines through and makes you more approachable. The more you push yourself to attend events, the more at ease you’ll feel and hey, you might even start to look forward to them! Overcoming those initial nerves and scepticism that are so common amongst networkers (you’re not alone!) is the key to harnessing the benefits that come with it. Remember, many of your peers and competitors have the same concerns. Once you get the hang of things and overcome those initial nerves, you’ll start to become more aware of the opportunities available. Aside from simply being seen to be there, opportunities for exposure are abundant. Showcasing your name, brand and your services can be achieved through many avenues, whether that’s sponsoring an event, speaking at an event, or even organising one yourself. Have some business cards at the ready, being helpful and enthusiastic. How can you help others? This is a far more effective strategy than simply ‘self promoting’. Speaking with passion and enthusiasm, makes you more memorable and engaging, and if you appear to have authority and confidence in what your business does, others will find it easier to form a trusted relationship with you. Good advice and guidance can be extremely valuable when you’re trying to grow your business. Networking gives you access to people who have a wealth of knowledge. And, as the old saying goes, ‘there’s no substitute for experience’. Knowledge, insights and information from your peers could be just what you need to evolve to the next level. 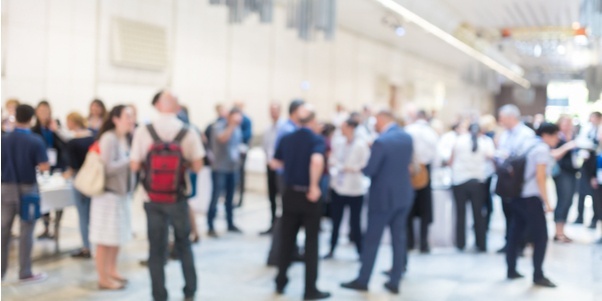 Often, you’ll find that even people in the same industry can be helpful and provide valuable insight in the friendly environment of a networking event. They may have made mistakes in the past that you can learn from, and forming a relationship with them means they could continue to offer unique advice that might otherwise not be available to you. In-person communication often gets overlooked in the digital world we live in today. But with face-to-face interaction, you can tune into your emotional intelligence to filter out who is really genuine, who is really interested, and who is wasting your time. Making valuable connections can keep on serving you for years to come. The reciprocal nature of humans means by doing someone a favour, the likelihood is, they’ll return it at some point. Equally, having a network of connections puts you in close proximity to their connections. Perhaps your contacts can facilitate introductions or refer you to contacts of theirs. With a reliable network of high-quality contacts, you have on-hand opportunities to source new suppliers, generate sales, gain funding, support, and more. There will always be needs that match your offering. And vice versa. Networking events are a great place for facilitating productive relationships. Our number one tip for business networking events is to remember that we’re all in the same boat. We’re all there to make connections, speak to others and grow our businesses. The benefits are tenfold but often get overlooked in place of online substitutes. But there’s nothing quite as effective as showing your face at events, full of your local business peers, and adding a human element to your business. At a networking event, you are the face of your brand, and there’s nothing quite as unique as you.